Contact list is a list of selected names that all go from the same email. Group list is a selected group of people who share information around. Like a listserv. Invite is sent. 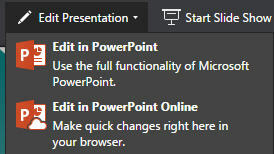 Use full functionality of Word, Excel and PowerPoint that comes with the offline, software versions. Use online version that does not have as many features. OneDrive is the directory, where everything is stored. In OneDrive, you can start new documents, upload from other locations, edit--either alone or with another person(s), and perform other tasks.